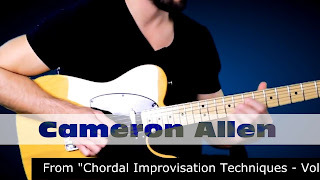 Cameron Allen: New Chordal Improv tutorial now available! My new lick package / tutorial is FINALLY HERE! "Chordal Improvisation Techniques - Volume I" takes a look at some ways to enhance your playing by using chordal ideas in a melodic way, and includes 17 demonstrated examples fully transcribed and noted in both .GPX and .PDF formats. New Chordal Improv tutorial now available!